Old School or Old Tech? Deep Air in the Overhead. Many times we as divers get stuck in a certain way of doing things. This may be a certain way we plan dives, a certain piece of equipment we refuse to part with, or a certain mentality on training and dive progression. In many cases this is natural and often times does no real harm. Every now and then however I see something that just cannot be justified anymore. As someone who was once attracted to deep air for its simplicity, and let’s be honest, its cost or lack thereof, I have found myself looking back and realizing how far we have come. I had a Trimix fill station in place at my small dive shop by the time I took a Trimix course. I did my Trimix course on wrecks that I had previously dove multiple times on air. In some ways that experience made me appreciate what helium does for us, having been able to experience the same dive both clear headed and not I began to realize the difference. Teaching my first tech course with my student on air and myself on helium I really appreciated being clear headed. I can’t imagine teaching that course on air. Even after having dove helium based mixes for a number of years though it wasn’t until a certain exploration dive that I really had the message driven home. I had explored a tunnel at the bottom of a pit just far enough to realize the tunnel went and that it would require a sidemount configuration. The passage was shallow leading to the pit and the tunnel at the bottom appeared to go forward at a depth of 130 ffw/ 40 mfw. I made the decision to go back with one of my regular dive partners (wife) on open circuit 20 liter sidemount cylinders and finish exploring and survey the passage. It was low and silty with minor flow but quite pretty. Getting to the point where it was obvious the tunnel was essentially ending I turned the dive and began to survey. It was here I found the error of my gas choices. While I felt fine going in laying line on a non-helium based mixture, when I turned the open circuit bubbles caused bacteria growth and silt to rain down limiting visibility to inches. This once clear new tunnel was now quite an unpleasant place to be. I then realized I had several protrusions to negotiate on exit in the low passage and wished I had placed more silt stakes and ties than I had. I knew I would be alright…probably…but found the level of overt narcosis go through the roof. It wasn’t even that deep…compared to dives I had done on air previously, but when it came to a low visibility, unexpected scenario, helium would have been REALLY nice. I respect the fact some areas have limited access to helium based fills. I also respect the fact it is prohibitively expensive in some areas. If you can’t do the dive safely, and this includes attaining the proper mixes, then you don’t do the dive. However, I am truly amazed how mainstream deep air remains even in North Florida cave country. An area that probably has the most readily available and most inexpensive trimix fills in the world. I do not think I will ever change the mind of the 40 year cave diver who is dead set on keeping things simple and diving air, however I find it reprehensible for new divers to be instructed and mentored in that diving deep on narcotic mixtures is acceptable. Most of us accept the fact that an END of 100 ffw/30 mfw is the maximum suggested for overhead diving. I consider this to be the maximum accepted for rebreather diving as well since a rebreather, like a stressful situation in the overhead required clear thoughts and reaction times to be at their best. As the owner of a facility where I see a wide shotgun style scattering of training philosophies and experience levels let us look at two of the most problematic scenarios. I see MOD 220 way too often, especially on CCR divers bailout cylinders with Air in them. Divers, remember there are two things that create an MOD. One is oxygen content but the other is helium content. The maximum END in the overhead should be kept to 100 FFW. This keeps the diver sharp and at their best if something does occur. Agencies like IANTD have recognized the need for a diver to be able to complete their entry level technical courses without being forced to experience the deep air dives prior to going into what has traditionally been thought of as “Trimix” diver depths. Advanced Recreational Trimix courses for instance allow the diver to dive TRUE normoxic oxygen content while adding enough helium to keep the diver sharp and at their best. As a result I have not taught an “Air” decompression course in years. The maximum END in the overhead should be kept to 100 FFW. This keeps the diver sharp and at their best if something does occur. We have the technology, we know the benefits of helium, and we also know that narcosis is a real thing that impacts all of us. A recent Florida Highway message was this: “buzzed driving is drunk driving”. Well I propose that ‘Buzzed diving is drunk diving’. Most would look down on someone who slams two beers and jumps in the water to do a cave dive. Why do we see a 150 foot cave dive on air differently? We have the ability to be clear headed and we owe it to ourselves to be so. We as instructors also owe it to our students to promote such. The days of deep air need to die the way of stuffing the long hose. There is a better proven way. It does not matter what I or you, or anyone else may have done in the past out of convenience, lack of resources, or misguided interest. We build our sport on the experiences of those before us and hope that the next generation does not have to learn the hard way, lessons that we have already learned and survived. Let’s move forward! I recently had an instructor tell me he wants his students to perform a check in class that they will actually continue to do throughout their cave diving career and that the traditional S Drill is antiquated and no one will continue to do it so why teach it as such. I believe this is a false idea and that there are two problems and scenarios that need to be addressed. One is the S Drill as a training tool, and the second is the S Drill as a predive method of ensuring the long hose is free and all regulators perform properly. Let us look at both of these goals and how they can be executed during class and be used, or not, throughout a divers career. Let us also look at some of the things that go contrary to the goals of these skills that are common place in the technical dive industry. “If this were a full cave level class I would get out of the water”. This is an actual quote I heard and while it sounded harsh it was true. It was the first time I really took to heart that there is a level of proficiency expected of a diver at a certain level in terms of buoyancy, task loading, and propulsion. The point was that at the upper level a diver should be solid in fundamental skills. Granted these are skills fine-tuned and perfected along the path to that upper level. A technical diver should be able to hover, without drastic variation in depth, maintain trim (many don’t even know what true trim is), maintain position in the water via finer finning techniques and motor functions, and while doing all of this perform a task. This is what the S-Drill helps to instill, teach, and test. 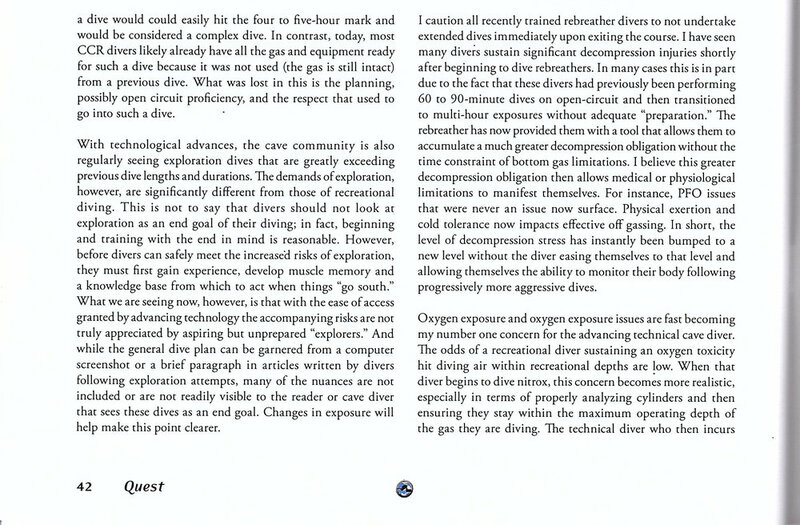 If a diver cannot maintain position without going up or down by more than 2 feet and perform a task in the confines of two body lengths (divers head to head facing each other) then they will never be able to gas share or perform other functions in a tunnel or room (in the case of a wreck) that is 5-foot-tall by 12 foot wide. Not a tiny space in the grand scheme of things. All skills should be performed in open water prior to being performed in the overhead. This S-Drill as a training tool is the open water skill performance review prior to having a team share gas in the overhead. If they cannot maintain their buoyancy and position in open water, then when this is performed in the overhead, the odds of it going well are not good. I do not expect a dive team to perform an S-Drill like this before EVERY dive after class. They should practice it periodically with their regular team members on a schedule that will allow them to remain proficient. There are cases where this cannot easily be performed in open water. Perhaps that means those caves are not appropriate training sites for cave class. Does the site add training value? This is something we should ask ourselves as instructors. Will this skill make my students a better diver? Am I as a diver truly proficient in my basic skillsets? The S-Drill for teaching is so much more than just sharing gas. It is a task loading scenario. It is a team building and communications scenario. I once found myself glossing over this skill because many of my mentors glossed over this skill. It is time consuming. Especially when you have students that can’t do it proficiently. Sometimes that means we never even make it in the overhead on the first dive. That is fine. We are here to learn and as students and instructors we need to be able to separate training dives from experience dives. The end goal in my classes is for a team of divers to be able to safely execute a dive together at the level of their certification. The training and skills intensive dives should lead up to this. These training dives should be challenging and the course rewarding. The training dives may not be “fun” for the instructor especially. They should be productive and rewarding and through this at the end there should be a level of satisfaction and enjoyment gained by the students and satisfaction and reward gained by the instructor in seeing their students succeed. The second type of S Drill and the second reason for performing them is as part of an equipment check. Anyone who says technical divers don’t like to pick at gear configurations and deficiencies has never gotten on an online forum or Facebook page. Unfortunately, this type of mentality gets out of hand in some cases but like most others I do take note of deficiencies. Here are some of the common things I see in tech diver articles and pictures and the problems associated with them. High oxygen decompression cylinders being staged on the right side of the diver is a common problem for several key reasons. The first is that when deployed, the hose from that bottle does not route well around the divers neck. Therefore, if they must drop the regulator it becomes an instant dangling entanglement hazard and is also generally not as comfortable to breathe from. When scootering, and yes this is a natural progression in many cave and wreck careers, that bottle catches much of the prop wash on the right side thus creating significant unneeded drag. The most serious though, and the one as it relates to the S drill and long hose, is that when attached that stage on the right side most likely has trapped the long hose and will prevent its immediate deployment. This is a true safety issue. The number of dry suit hoses I see clipped in over a long hose is significant. It is easy to remedy but when I see this is says two things. One is that the diver clipped in his dry suit hose last, which is probably not the ideal scenario, and two no S Drill was performed otherwise this entanglement would have been discovered. This is most often seen on rebreather divers where the diver has opted to stow the long hose on their bailout bottle. I often see that the long hose is dangling below the diver having been accidently pulled from hose retainers. This will lead the diver to reaching to the bottle only to discover no second stage is available having previously been pulled free. The second thing that I see which is quite common, is to prevent the previous scenario by stowing the second stage tight on top of the cylinder. Unfortunately this limits the ability of the diver to immediately be able to reach and deploy the regulator. There does come a point of too much streamlining where it impedes more important abilities critical to life support. A very common scenario is for divers to incorporate an inline shutoff on regulators not in use. This is particularly common in CCR divers however for some reason I am seeing them pop up on side mount open circuit divers as well. This is very problematic. I do not believe in hypotheticals and as such a case study is in order. A local cave instructor was diving with two other exploration team members when he experienced a catastrophic failure of his SCR manifold. Due to incompatibility issues with fittings (all from the same company) he was unable to secure gas from his system. When a team member donated his long hose, it failed to function. The OOG Diver then went and checked the valve of the donating diver. Only after inhaling water via inversion of the mushroom valve on the second stage (clearly near drowning) did he realize there was an line shutoff on the regulator. Any regulator that may be needed in an emergency should be unencumbered and capable of immediate gas delivery. In short there are a great many things than can inhibit the flow of gas or the ability to donate gas in an emergency. The S-Drill as a daily ritual is crucial and can be modified to be performed at the surface while still checking all the required pieces. Unfortunately, when this is taught exclusively as a surface skill the actual sharing of gas while maintaining buoyancy and position is often a lacking ability. Sharing gas is not a thing of the past. With the advent of side mount and rebreathers I am hearing more and more people tell the public and their students it is an unrealistic scenario since they are self-sufficient. While those divers should never have to perform a gas share it continues to be a routine performed, and never expected. In all but one of the 5 real life scenarios where I personally knew the divers involved the diver who spontaneously asked for gas was not out of gas. They panicked during gas switches, failed to maintain sidemount bottle gas management, or thought they had bad gas when in fact they CO2ed themselves swimming too fast. In those 4 cases the divers involved were sidemount or CCR divers. In the 5th case the diver was a long time technical diver and cave diver who failed to maintain proper reserves on a technical wreck dive in doubles, ran out of gas, and had to share gas with his team member. Obviously, this scenario is problematic on many levels, however the reasons do not matter to the donating diver. They must now perform in order for the team to survive. The S-Drill set’s them up to be able to do so. To close, it is certain there are two reasons to perform S Drills and two ways to perform them. The first, a neutral S Drill, hovering, maintaining buoyancy and sharing gas teaches team work, task loading, and reinforces buoyancy. It ALSO checks that all regulators are functional and the long hose is deployable. It meets both requirements. The second, modified S Drill checks that all equipment is functional. It is a more appropriate method of preparing for a dive by existing team members after class. Let me be clear, I see two distinct levels within this sport. There doesn’t have to be. In fact I wish that those at all levels would strive to emulate and be as precise and competent as the upper level. I do however see a line within the sport where when you cross it, you are now at the top of the food chain. You are at a level in the sport where there is very little room for compromise, very little room for error. Cave diving in my opinion, certainly falls into this upper end of the sport. As a cave instructor it pains me to see divers that come into the sport, or are already in the sport, who do not seem to understand the importance of certain key concepts. I could expand indefinitely on this but I am limiting this to a single focus, and that is gear choice. As a diver at the top end of the sport, in a segment that holds inherent risk potentially higher than that of the lower recreational levels, equipment decisions should not be taken lightly. If a diver is going to be at this level they need to take the sport seriously. They need to take their equipment choices seriously. Good enough doesn’t cut it! You need to seek out the best available now, not what was the best when you were certified 10 years ago or what your instructor bought 10 years ago, and certainly not what is just as good as what you started open water with 10 years ago. Technology evolves; a diver at this level needs to choose the best equipment available today. Part of what allows us to continue to save ourselves heartache and problems is evolving technology. We owe it to ourselves to take advantage of it. Regulator choices need to be taken seriously. There are many regulators I would not criticize the newly minted Open Water Diver for choosing to dive with, but I would simply not allow a cave student to use in my class. A quick example are any of the “slimline” octopuses. One of the areas that is paining me more and more in recent years has been lighting choices. I am hearing divers talk about lights at the dive site and what they deem as great deals. The 10 Watt HID of 10 to 15 years ago were absolutely fantastic lights at the time. It was one of my first canister lights. It is absolutely true there are many lights out there brighter than this one that are in current production. However, we must ask ourselves whether or not it is really the best available now and is it appropriate to our needs as true technical and cave divers. What is built as a backup light today is just that, a back up light. It doesn’t matter it has the lumens of our canister lights of old. First we need to discuss burn time. A Light that only burns for 1 to 2 hours is in my opinion not an appropriate light for this side of the sport. Forgetting the fact you will outgrow it at some point, it does not have the adequate burn time in the event of problems that may lengthen the dive itself. To answer by saying I will simply carry two of them is also not acceptable in my opinion. Get the correct burn time for the job and get a light you can run on the power you want. Running on a candle because to run on high would not get you your appropriate burn time is not the answer either. Build quality, or lack thereof, is still a true concern for the vast majority of lights being produced in the Far East. I will give you an example of a method of production that I have seen in a number of “dive lights”. An LED module is inserted from the front and then a stainless or aluminum bezel is screwed down over the lens. At depth the pressure reduces the tightness of that bezel, it can then begin to spin, and while in most cases the lens is held in place by pressure at depth, it is then allowed to flood at the very end of the dive in shallow water or on the surface when the pressure is relieved. I am seeing Goodman handles being molded from plastic and breaking. I am seeing corded lights with very questionable cables that truly appear to be more suited for my laptop than for diving in a harsh environment. I never understood the mentality of, “well they have great service, I had a problem and they sent me a brand new light”. You should not be having routine problems to begin with. Yes when you do, service is important, but just recently on one of the forums I saw these exact statements. Good service should not be viewed as quick replacement of the faulty product. It should be deemed first and foremost by not having to deal with the service department at all, and then on the rare occasions you do, you should be met with prompt service usually in the form of a speedy repair at an acceptable price. It is rather hard to do that when the manufacturer is overseas. Yes there are lights in Europe I would probably dive if I lived in Europe. Right now as a serious American cave diver I see there only being 4 true manufacturers of dive lights that have high build quality, acceptable burn times with acceptable light outputs, and on those small occasions where it is needs, prompt and good service, within the United States market. Light Monkey, Halcyon, Underwater Light Dude, and Dive Rite are the most popular lights in the cave diving scene for a reason. I am sure others will emerge, just as those four have continued to evolve their manufacturing in order to stay relevant in this industry. Don’t be cheap. Lights are part of the kit you are taking into a very unforgiving environment. Make your choices carefully. This is a question I get asked a lot. In almost every single technical course I teach I am asked by the student which gradient factor should they set their computer to. The next question : What gradient factor do you dive? I hate this question for a couple of reasons. First what I am comfortable diving is not necessarily right for that diver. From a liability standpoint if I tell a diver to run 35/85 and they take a DCS hit I don’t want to be morally or legally liable. The only gradient factor I can suggest is the factory default. But I am getting ahead of myself. Which one is right? First people need to understand what those numbers are doing and I will put it in basic layman terms since that is the best way for us to understand it. If you hold a technical degree and know more than I do and can expand in a way I will be able to understand I would love to hear from you. You have a line, and that line is basically the point at which the vast majority of divers should be able to get out of the water and not have DCS problems. Notice I say vast majority, not all. That is that second number, in this case 85 if we are running 35/85. So imagine that as a margin of safety at 15 since that is what is left when we assume 100 is that line. Now the first number. That 35 is going to dictate your first stop with 100 being the point to which you could ascend to and again most likely not have issues. Keep in mind after a 300 foot dive that line that is the 100 may start at 150 feet. So what we have is a low starting point and a merger up through your stops until that 85 is 0 feet of depth. Now the diver needs to understand 2 things. First there are many factors that play into decompression. Your stop depths and times are only two of them. Dehydration, mental, and physical stress, warmth, ascent rate, and general physical variants can all cause these profiles to work better or worse depending on the day. The second is that this code and the various tables and computers used by divers are not all coming from a single source and a single code writer. The author must create a starting point and incorporate the code and theory he has chosen into a useable format. I will give an example. I once did a dive on Open Circuit to 175 feet for 1 hour of bottom time. I had two mixed gas dive computers from mainstream reputable companies. With the exact same gradient factor on that dive I had a 20 percent difference in the decompression obligation between those two computers. I continued to dive them both, not necessarily together, and had no significant decompression related issues from dives performed with either one. Now here is the important part. I have known divers who got bent using gradient factors I would consider to be VERY conservative. No I won’t say what they were. I have also known divers who for various reasons aborted deco and suffered no decompression hit. I have also completed my deco 25 minutes sooner than other team members on the exact same dive using the exact same gasses, gotten out of the water and was fine while they got bent bad. So we are left with some very real facts. First; stops and times are important but equally as important is the “Art of Diving”. Ascent rate, hydration, relaxation at deco, staying warm. These are all in my opinion as important as your stop depths and time. Next let’s look at risk. Having told you that divers I know have gotten bent while using in my opinion quite conservative gradients do you still feel comfortable diving a gradient factor that leaves almost no conservatism and brings you up very quickly? Are you diving it just because your instructor is diving it? I have no problem doing deco. I am much more comfortable in the water than in a dry chamber with IVs hooked up. I have no problem doing a little extra deco. So why am I writing this? First I want people to seek out education for themselves, not just blindly follow what someone else does because that very experienced diver may have 20 years of doing things a certain way, and that certain way might not be correct for you or even them for that matter. I want people to evaluate the dive, assess the risk they can accept in terms of their dive profile and dive safely. I have evaluated the risks and chosen my dive planning. Have you? Or have you just plugged in numbers someone told you to use on the internet or in that video you watched about an exploration project. Oh but if you are diving 100/100 or something very close to that, believe me you are wrong. Safe Diving. -Jon B.